Ahhh....the days after Christmas. I am in the thick of it. My sleep schedule is completely askew,my wrists burn from knitting too much, and I've completely forgotten what the sensation of hunger feels like. I started this post fully intending to tell you all about our handmade Christmas. To hop right back into the full-time blogging scene. I enjoyed my little blog break very much yes, and I found it so refreshing to hop on to my reader and mark all as read. Voila! All caught up. Hmm...it feels good to be caught up. It feels good to be coloring with Z-cakes instead of writing a blog. Really good. So good, I think I'll keep on with that little break. Yes...I think I'll take that break right on into twenty-ten. These were so fun to make. I mean, like, really fun. Every time I made a new one I thought to myself this is the best one yet! I especially loved personalizing the colors and scents for those they would be going to. I'll be making more with my mother-in-law this week. Methinks I see a tutorial in this blog's future. Also pictures and details about the rest of my homemade gifts. Those are in this blog's future too. And now friends, I will leave you to your new year preparations. Here's what I'll be doing in the meantime. Knitting :: these gloves. I'm almost done and can't wait to wear them all the live long day. Reading :: this book but planning to soon toss it away in favor of this one. Playing :: this game and this game that N8tr0n got for Christmas. Dreaming :: of my up and coming crafting obsession courtesy of this book and this book. Scheming :: a way to watch Elf again with my sister-in-law. It's even funnier than I remembered. Debating :: the idea of going back to work full-time. Writing :: my resolutions list. You may know that I take my list making quite seriously and a new year is the equivalent of a list-maker's playground. 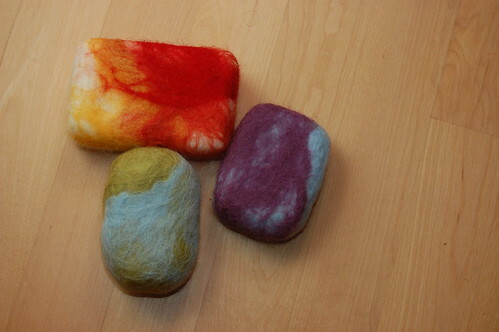 Ohh I love those felted soaps! I have a question though, a noobie question... is the purpose of the felt, say, an exfoliant? Do you remove it before you use the soap or leave it on? (see, these are the things that keep me up at night). I can't wait for the tutorial! You're right Femme...the wool acts as an exfoliant. 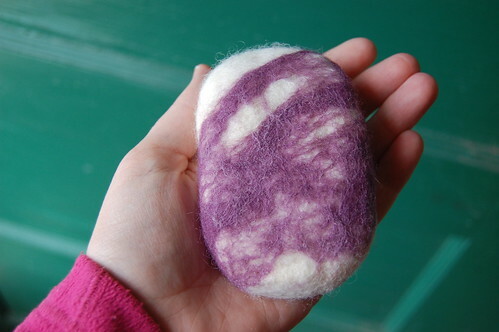 No need to remove the felt before you use it...in fact, as the soap gets used up, the wool continues to felt and get smaller and smaller. So happy you are spending your blog-break time with us!! Awesome links. Yes on the tutorials when you return, please. such a lovely pleasure to meet you today!